With the recent news about the announcement of a royal wedding, I thought it would be a good time to visit a curious disc set in my collection that featured another royal event in the news. In the middle of the unrest in Europe, Great Britain faced an upheaval in the monarchy with George VI's ascension to the throne. George's elder brother, Edward VIII, abdicated the throne to marry the socialite Wallis Simpson. The story received considerable coverage here in the US and the networks carried the BBC's coverage of the coronation of the new king. This disc set includes the ceremonies leading up to the coronation, the coronation itself, along with the new monarch's first speech and sounds as if it was recorded either direct from the shortwave feed or from a network line carrying the shortwave broadcast. It's unclear to me if the coverage is continuous or represents various excerpts from the broadcast. The origins of the disc set are obscure, but it appears to be produced by a small company as a souvenir of the event for US listeners. It gives a good idea of what listeners heard stateside that tuned in to a royal event that only happens once a generation. 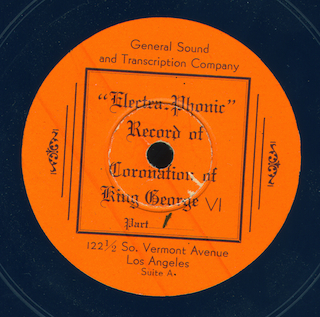 Our digital file was transferred from an original blue shellac 8-sided 12" 78 rpm set on the General Sound and Transcription Company label, matrix numbers AT1210 through AT1217. The style of the pressing and matrix numbers indicates it may have been pressed by Columbia. Now a bit of comedy, courtesy of "Hancock's Half Hour", an influential BBC situation comedy broadcast from 1954 through 1961. It was one of the first BBC comedy series that took the form of a sitcom, something fairly common at the time here in the States. "The Jewel Robbery" was originally broadcast on the BBC as program 2 of the 3rd Series of "Hancock's Half Hour" on October 26, 1955 and was recorded on October 3, 1955. It was distributed to foreign markets as Program 18 in the series by the BBC Transcription Service in the late 1950s. The show was dubbed from an original shellac 16" BBC Transcription Service set, matrix numbers 16PH87870 and 16PH87871. So far, these, along with some "Goon Show" discs distributed by the BBC around the same time period, are the latest shellac transcription pressings I've found. It's curious they weren't pressing these on vinyl at this late date. Update, 6/25/2009 - Corrected post based on information from Jim Exley. I incorrectly identified this episode as "The New Car" from December 7, 1954. "Hancock's Half Hour" was an innovative and influential British comedy series broadcast from 1954 through 1961 on BBC radio. The show was one of the earliest British radio comedy series to take the form of a sitcom, rather than the variety show format that was common on the BBC at the time. The introduction of the format was probably influenced by the availability of network comedy series from the US that could be heard over Armed Forces Radio in Europe during and after World War II; of course, the sitcom had been a mainstay of American radio for several years. "The Bequest" was program 17 in the series as it was syndicated by the BBC in the US and Canada in the late 1950s. In the series, Hancock plays a down-on-his-luck comedian and, in this episode, he discovers that he's inherited a large sum of money on the condition that he gets married. The program originally ran on the BBC in the 3rd Series of "Hancock's Half Hour", recorded October 30, 1955 and broadcast on November 2, 1955. You can find out more about "Hancock's Half Hour" and Tony Hancock's work at this fan site. And if you're wondering about Sabrina, mentioned near the end of the show, you can find out more about her at Wikipedia. The program was transferred to digital directly from a set of BBC Transcription Service discs, matrix numbers 16PH 87858 and 16PH87859.